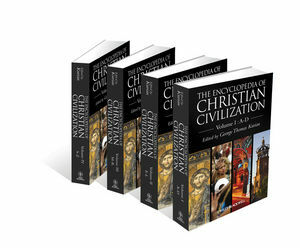 The Encyclopedia of Christian Civilization is a comprehensive reference work on the history and impact of Christianity. Over 1,400 entries provide an in-depth and dynamic look at Christianity both through its history and the way it has shaped societies around the world. Through a clear and attractive format, a series of interlocking major themes is explored, including: key theological ideas; global and regional history; worship; society and Christianity; literature; music; art; architecture; education; politics; law, and scholarship. Uniting these themes is an understanding of Christianity as a truly global phenomenon with strong denominational and regional identities. The entries are written by a team of over 350 scholars and teachers from over 24 countries. Together they present a wealth of current research in a clear, concise, and attractive format. The Encyclopedia of Christian Civilization is an essential reference for students, researchers, academics, and practitioners. George Thomas Kurian is the President of the Encyclopedia Society. He is the editor of 60 highly successful reference works including 27 encyclopedias, including The World Christian Encyclopedia, Nelson's New Christian Dictionary, The Encyclopedia of the First World, and The Encyclopedia of the Third World.